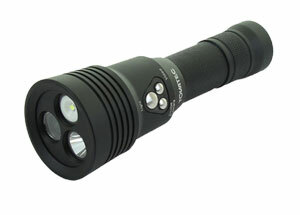 a diving torch with a built in camera! It has a generous 1000 Lumen light output and the rechargeable lithium-ion battery (included) will power both the lamp and the HD video camera for 1hr 30min. The camera is1080p, 60 frames per second and 4MP. It shoots jpg format and is stabilised while all that lovely imagery you capture is saved to a handy micro SD card. Its rated to a maximum depth of 60metres.